I just bought the renown HyperX Cloud II headset so I could see if I was missing out using my Philips X2 headphones. These are known by the gaming community to be one of the best bang for the buck headphones on the market now. 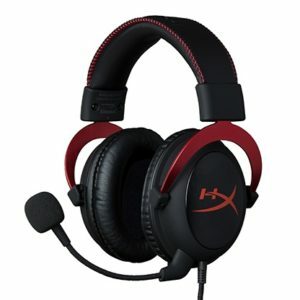 HyperX has redesigned this headset using the Takstar Pro 80 as the base (a well known and reputable headphone) and added a mic. Why wouldn’t you want to use a headphone known for a good soundstage? These feel far better than I expected for a gaming headset. I previously tested the Logitech G series headphones and they immediately felt like they were lacking refinement in almost every way and they creaked when you put the headset on. The Cloud II pleather ear cups are quite comfortable for a stock earpad and creates a pretty good enclosure around the ear. The first thing I thought of was how the Brainwavz HM5 earpads would fit and change the sound. I’ll have to try this at a later time. The headband is comfortable pleather with a 1/2″ of padding. I prefer the floating type headband from my Philips X2, so I was surprised that this did not cause any discomfort over time. Perhaps they might become uncomfortable as the foam wears down, but I believe that would take a very long time. After 3 hours of playing PUBG last night, I did not feel fatigued. I did find that changing from an open-back headphone to a closed-back headphone took a bit of getting used to. The feeling of not being able to hear my own voice and not hearing outside sounds made my voice over Discord slightly too loud. Sound quality is better than I expected from a $99 headset. Most gaming headsets seem to lack bass and fill your ears with treble and some mids. The Cloud II brings a surprisingly neutral sound for a gaming headset. The bass is not overwhelming and adds more than most other gaming headphones do. As I said above, changing the ear pads slightly change the sound quality. Some may be better than others and it’ll become an experimentation game if you want to change them out. I’d recommend the Brainwavz HM5 earpads. As a side-note, I’ve been playing all games with the 7.1 surround sound off. It seems to play a bit better in PUBG. With the 7.1 on, all audio becomes more distant and a bit off. I’m quite surprised about the quality of the microphone. I was expecting it to be mediocre but it’s really blown me away and again for the price it’s quite good. My other set up is a Philips X2 with a VMODA Boom Mic which sounds great. The Cloud II sounds a smidge lower in clarity but I did not find it to be an issue. I’ll upload an audio quality test soon. The internet is right, this is probably the best bang for the buck headset you can get. Audio positioning in PUBG is great, the bass is there, treble isn’t too bright, and the mic sounds good through discord. If you are in the market for a set, pick these up!